Technology should be used for awesome. Update January 12, 2016: This seems to be very popular, and fixing a LOT of GoPro cameras! I’m going to re-visit this soon, and update it. I hope it can continue helping everyone save GoPros from the trash bin! If you try this fix, remember to post a comment and let everyone know how it worked out! Just recently, I had a problem where my GoPro HD Hero2 would not turn on, with battery or USB connection for power. Reading up on it a bit, I found that many others have had this issue, and aside from the few voodoo “fixes” which involved insert-remove-power-button-blah sequences, the only real fix was to re-flash the firmware. This seems to me to be a symptom of bit-rot in the firmware flash chip, with a weak cell or block, that would read out properly once in every 50 attempts to boot. GoPro’s instructions for updating firmware involve downloading their CineForm software that has a magic flasher integrated somewhere. I don’t like big bloated software downloads to do little things, so I found a way to do it without it, on YouTube by user WellingtonBikeCam01. So, here is the fix, with much credit given to that video (which is marked CC-BY-NC, so here’s a modified version of the instructions with my own experience mixed in). Try this at your own risk. If your camera is under warranty, and you are not experienced with firmware flashing, just send it back to GoPro instead. UPDATE: Check Dan’s comment below – and try putting the thing in the fridge for a few hours first! It’s worked for me on jinky hard drives, too. For those who are curious about the fridge thing: Cold spray (in a can!) is commonly used as a diagnostic tool for electronics, because it does two things: first, it alters the physical dimensions of the device, which can cause micro-cracks to open or close or otherwise make themselves known; second, it alters the electrical characteristics of the device, possibly pushing it just into or just outside of a tolerance limit. This lets you identify broken parts, and (in our case) possibly coax something into working when it is otherwise not doing so. I suspect the flash memory chip, since they can fail by having their data fade away. Pushing the tolerance of “data won’t read” into “data just barely does read” by making it cold is possibly why this works for us here. Read all instructions and understand that if there’s a problem, it’s your problem, not mine. Make sure the camera battery is fully charged. Optional, for difficult cases: Put camera in fridge/freezer, inside a ziplock bag. See comments below for info. Copy the firmware file to an SD card. Optional: Remove camera from fridge/freezer. Insert the SD card into the camera. (Retry from here, see below) Remove and re-insert the battery. Place the camera on a solid table surface. Hold down the top “shutter” button while turning the camera on with the front “power” button. Release the shutter button only after the camera display appears. If the display doesn’t turn on within a few seconds, this boot attempt failed (yay bad flash chip). Go to the remove/insert battery step above where it says “Retry from here”, and do it over and over until it actually boots. It may take many tries! Press and release the power button, you need to do it quickly after the camera turns on and you release the shutter button (so I have read). A prompt will appear that says “press 1” – Press and release the power button. A prompt will appear that says “press 2” – Press and release the power button again. The camera will install the first update and turn itself off. The red light will blink, and it will show an updating icon on the screen. Don’t touch the camera at all! If the power is interrupted by a jinky battery connection during the flash, you may brick the camera! Don’t even wiggle the table. Just wait. My display said it was installing version 77 (bootloader maybe?). (v198 only, says the original YouTube instructions. Not sure if that’s the case?) Power the camera on, and the update will continue for about a minute, installing the next part of the firmware, and the camera will turn itself off. My display said it was installing version 222 (operating software maybe?). Delete the “HD2-firmware.bin” file from the SD card. It’s recommended to delete all files from the SD card and format it freshly before doing a firmware upgrade. All camera settings will revert to defaults after the upgrade. If you have any special settings, write them down first. You may have to reformat your SD cards in the camera for them to be recognized. It’s always best to format cards using the device they are used in, instead of on a computer. It’s a good idea to verify the hash of the new file before installing it. I found in the process that there’s this thing called ProTune, which activates new framerates and resolutions that are useful for professional film shoots. It also applies a more neutral color curve to the recorded image, leaving greater latitude for color correction in post-production. Very handy! And, finally, in the spirit of the YouTube author that made my day, this post is CC-BY-NC-SA. UPDATE: After flashing, my camera was booting up just fine, but being jinky. It would stop recording after a few seconds, or randomly lock up, or otherwise behave badly. Did the usual routine of formatting the SD card in the device, etc. The first try of re-flashing died after a few seconds – I panicked, thinking I had bricked it. But, the bootloader/flasher was intact, and I was able to flash it again. It’s working better, but still locks up when flipping through menus, etc. Think I might be sending it back for replacement. Sigh! UPDATE TO THE UPDATE: Two update? This is obviously too much of a hassle. During recording, it *appeared* to be locked for a few seconds, red lights stuck on, time counter at 00:08, nothing happening. Five seconds later, it counted up to 00:14 really fast, and kept going. I wonder if my SD card has bad blocks it’s controller is sparing out? Going to do a full zero-overwrite on it and see if it helps. If you try this fix, remember to leave a comment and let everyone know how it went! Since I’ve had far too many years of professionally dealing with PC troubleshooting, I went through all the normal steps you might expect: uninstall and reinstall the drivers, install different driver versions, blow away the preferences file, restart Windows, etc. Nothing worked. To be clear: this is a 64-bit install of Windows 7, and I tried Wacom driver versions 6.1.6-7 and 6.1.7-3, with the latest After Effects CS5.5 updates (reported as version 10.5.0.253). It struck me that the pen was working much like a mouse, I could gleefully get motion and clicking, but no pressure, tilt, or any of the good stuff. 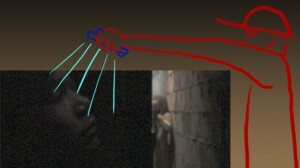 Remember, this is only in After Effects; the pen worked fine in Photoshop. During one of my uninstall / reboot / reinstall iterations, I noticed that Windows picked up the Wacom Intuos3 as a mouse, but of course nothing used the tablet features because there were no drivers installed. 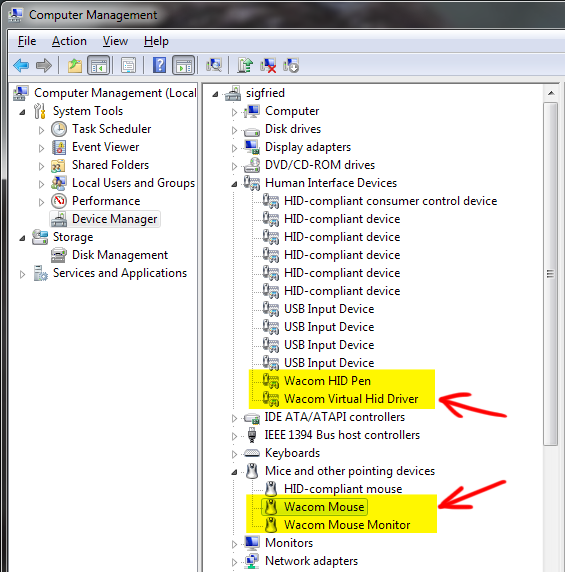 So, I checked the Device Manager, and found that there was a generic “HID-compliant mouse” installed for the tablet. I verified the Vendor ID, and also unplugged my regular mouse to be certain it was the tablet. It was. Notice that there are at least four devices associated with the Wacom Intuos3 tablet, which I highlighted in yellow. Two of them, under the Pointing Devices grouping, seemed very mouse-like, and probably serve to drive the pointer around. The other two, listed under Human Interface Devices, smelled a bit more tablet-specific, and probably provide the pressure, tilt, and other fun stuff to applications. This is just a guess on my part. Going ahead with my theory that AE was binding to the wrong device first, I wanted to force After Effects to find the tablet drivers before the mouse drivers. I disabled the two Wacom mouse driver entries (which prevents the pen from moving the pointer, by the way), then launched After Effects, and finally re-enabled the two Wacom mouse devices. It worked! Lovely, glorious pressure sensitivity! I could brush my roto masks with finesse! Retouching became fun instead of a chore! The promise of the pen was fulfilled! Oh, happy day. And there we have it. A working, if annoying, method to enable Pen Pressure in After Effects! Update: After you do this, if you use Wacom’s mouse on the tablet at all, AE will switch back to mouse mode and not use pressure with the pen. So, keep the mouse away from the pad! You can use a regular mouse just fine, but the tablet mouse will switch things back to sucky mode. Desperation leads to crazy solutions. I had a nice shot lined up down a narrow crawlspace, but the foreground end of it was pitch black. We had no lights, no genny, no power, no battery-powered lanterns*, nothing. The way the sun and windows were angled made it impossible to bounce any light to my actor. But I wanted the shot! With nothing to work with, what could we do? I needed light. Anything would work. So I gathered up as many cellphones as I could. Now, we aren’t talking modern phones with handy LED lights on them (oh that would have been nice…) – what we had were old, small phones. A Motorola RAZR, and two Blackberries, and one other brick phone I don’t recall. I had a brave assistant stand just outside of the frame, and hold the phones up over the actor’s head. We had to time it right, by hitting keys on the phones to wake them up, get them into position, and roll camera before the backlights blinked out. It’s not easy holding four phones at once! Dim, tiny backlights. Framed so I could have them eight inches from the target. They threw just enough light that I could see my actor’s face, but I wasn’t hopeful that the camera would. We’re talking a 1/3″ chip HPX170. Amazingly, it did get something! Just enough. But noisy as hell, down there with all the muck. Thankfully, there’s Neat Video. It is saving shot after shot right now, and I’m loving every bit of it. Fantastic bit of code! Highly recommended. For the end result on this one, I ended up doing a split-frame, with very heavy noise reduction on the left, and less on the right so as not to crush all the grain and texture out of the wall. Remember when layering masks like this, to avoid a line where they join, select “Alpha Add” as the upper layer’s transfer mode in After Effects. This gets the alpha channels to add together properly, giving you a seamless result. It may not be perfect, but it’s pretty darn good, and good enough to save the shot and make it work in context of the rest of the film. I’ll call that a win! We pulled a lot of tricks like this for Binary Samurai… I can’t wait until it’s done! * As a side note – I have a Coleman lantern that is powered by eight D-cell batteries and sports a 13W CFL bulb. I wrapped half of it in foil for a reflector, and it makes quite the handy bit of extra light in those remote locations when we are without the luxury of a genny and grip truck. Wish I had it around for this shot! So, I’m working on all the postproduction for Binary Samurai, and I’m doing it with Adobe Creative Suite CS5.5 – Premiere Pro for the edit, which is done, and After Effects for the VFX. As many resources as are out there already, I couldn’t find much information on best practices for managing a project the size and scope of a full feature film. Even with a great book on AE VFX work by my side (highly recommended btw), I still had questions! Things like, do you break things up into individual project files, or use one giant one? Can Dynamic Link come into play effectively? Many more. Since I couldn’t find any answers, I’ve been blazing ahead and devising my own. I decided to contribute to anyone who may have the same questions by posting an ongoing log of my experiences here. Adobe has come a long, long way with their Creative Suite products when it comes to video, and they are more than ready to tackle the big jobs. Stay tuned for more! So it seems that ScriptUI Panels don’t receive layout events, under the 64-bit Windows version of CS5.5. A forum post I ran across has a few other people with this issue, and they report it affects After Effects, and Photoshop also. I was able to work around it a little, by calling the PanelObject.layout.layout() function. Unfortunately, it doesn’t help with resize events, but it’s better than manually typing in coordinates for controls. Can’t Print PDF to HP LaserJet 4050?